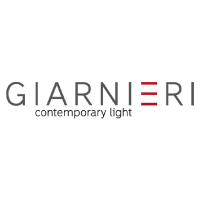 With Giarnieri, brand of GEA luce, a company founded in 1991 and based in San Severo, a new light was born. Functionality merges with design and just a few lines suffice to sketch innovative shapes to light up and furnish the spaces you live. The LED technology is the pulsing heart of little art pieces, all sharing the same captivating design, with a young spirit where modernity is synonymous with colour, character and life. Thanks to its know-how in the lighting world rooted in decades of experience in this industry, now the company creates made in Italy products that look forward into the future, exploiting the new technologies to experience light in all its functional and aesthetic potential.